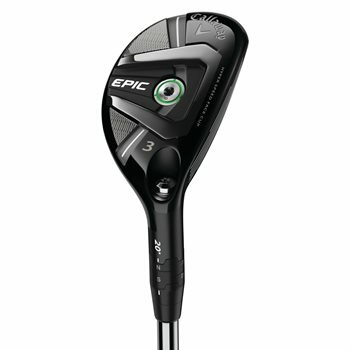 The Callaway Epic hybrid is the first hybrid to incorporate a crown consisting of revolutionary triaxial carbon which is the thinnest and lightest composite material Callaway has ever used. The weight saved by the crown is redistributed into strategic locations within the head to dramatically increase MOI and lower the CG, making the Epic hybrid exceptionally powerful, forgiving, accurate and easy to launch. The hybrid features a next generation 455 Forged Hyper Speed Face Cup that is more efficient at delivering faster ball speed across the face, especially on mis-hits, for increased average distance. The robust body frame positions weight strategically around the perimeter to increase MOI, and concentrates weight low in the head to keep the CG low and deep for easy launch. Precisely shaped MIM’ed (Metal-Injection Molding) tungsten Internal Standing Wave technology gives the adjustable hybrid the same low-deep CG properties as a non-adjustable hybrid. Weight saved by the ultra-light triaxial carbon crown is repositioned to increase MOI and lower the CG for easy launch and longer, straighter shots. Precisely shaped MIM’ed tungsten Internal Standing Wave gives this adjustable hybrid the same low-deep CG properties as a non-adjustable hybrid.